A colourful and tasty look-and-talk book to improve children’s vocabulary by introducing them to a wide range of food-related words. With 1000 pictures to spot and talk about, from raw ingredients such as fruit and vegetables to delicious dishes from around the world. Food is divided into sections such as the store cupboard, the fishmonger, a Chinese restaurant and more. A great book to share and talk about with a small child, and help them build their vocabulary. This book is fab for picky eaters! My second son is monstrous at mealtimes and I was looking for a book about food to try and break down any barriers. We found fruit in it which Nanna had eaten on holiday in Bali, so it was excellent for broadening horizons! A beautifully illustrated book full of pages and pages of every food stuff you could think of. Bert already loves going through the pages and naming all the food he already knows and hopefully it will help to introduce him to new foods as well. 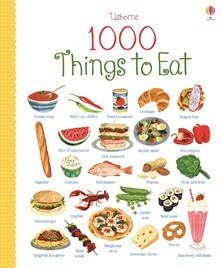 This pictorial encyclopaedia of 1,000 different foods covers everything edible... Attractive illustrations (apart from the monkfish!) and straightforward captions make this a wonderful way to introduce children to different cultures and countries. The section on celebrations foods is also a handy reference for teachers and fits in well with the Early Years curriculum topics of religions and festivals. It’s all here, from raw ingredients to cooked dishes from around the world, divided into sections such as home-cooked food, the sweet shop (sure to be a favourite), festivals and celebrations, and Indian restaurant. This is a great book to share and talk about with a small child, and a fun way to help them build their vocabulary.